Shots in their fast break, see Fast break - DeMatha Bingo recognition. 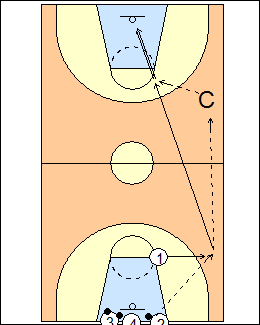 2 inbounds to 1, who pushes it to the far elbow for a pull-up jump shot. 2 goes next, run to the elbow then backpedal to the outlet spot for a pass from 3. The last player moves upcourt, becoming the first guy to get an inbounds pass at the other end, repeat coming back. Don't touch the baseline on an inbounds pass, you can't do it in a game. 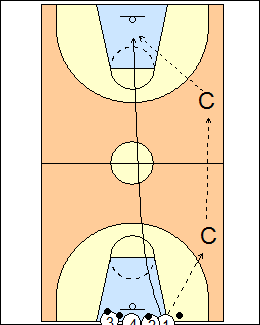 - break on-ball pressure then make a backcourt and frontcourt move. See Layups - Primary-secondary moves, Dribbling - 5star point-guard push. They want the point guard to throw ahead, 1 runs to the outlet spot for an inbounds pass, headmans to coach up the sideline, cuts for a pass and shot at the elbow (no dribble, catch and shoot), 2 goes next. 1 inbounds then runs right up the middle, the ball is passed up the sideline for a catch and finish at the rim. Every player does every drill (every position). See Fast break - Post sprint, Layups - Two minutes of hell. The inbounder becomes the trail guy, 1 jump stops to catch behind the 3-point line, takes a one-dribble pull-up. 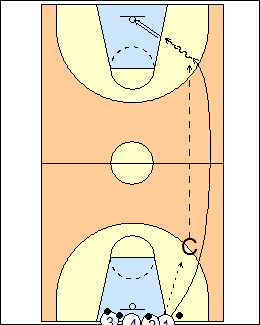 Variation (Billy Donovan) - use only the far coach, players advance (baseball) pass, sprint fullcourt for a return pass and 3-point shot. See Layups - Tennessee (transition jump shots). 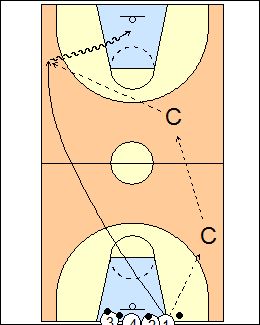 1 inbounds, sprints opposite (what a 3 will do in a game), jump stops for a skip pass from the slot (the second coach is the point guard), gets to the rim with one dribble. 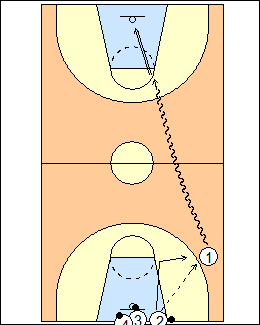 1 inbounds, runs wide outside coach (what a 2 will do), catches a pass in the air if possible (don't let it bounce), takes a one-dribble power jumper at the block, off the backboard. See Fast break - Outlet and go.